The smartphone that is to launch is the much-rumoured BlackBerry Ghost, which will come to the market as the BlackBerry Evolve. There are also rumours that the BlackBerry device will be accompanied with another smartphone called the Evolve X. Both smartphones will be sold in the country by licensee brand Optiemus Infracom. The company announced that the two handsets have been conceptualised, designed, and manufactured in India. The Evolve and Evolve X feature Corning’s Gorilla Glass 5, Series 7000 aluminium frame, and a BlackBerry textured and rubberised back panel. 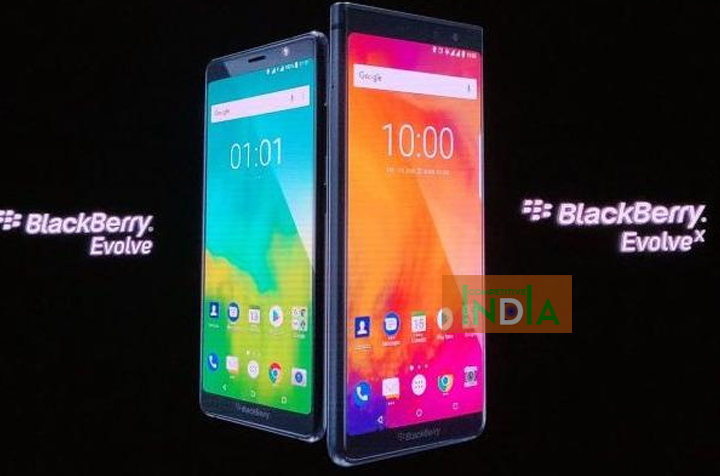 BlackBerry Evolve X and Evolve price in India, availability, specifications, and features have been revealed. The BlackBerry Evolve X price in India has been set at Rs. 34,990 for the lone 6GB RAM/ 64GB storage variant. On the other hand, the BlackBerry Evolve has been priced at Rs. 24,990 in India. The Evolve X will go on sale starting mid-September and the Evolve by end August. Both will be made available in India initially via Amazon.in, and subsequently via offline retailers. The Evolve X is the more expensive phone between the two and comes with Snapdragon 660 chipset with Adreno 512 GPU. The device will be available in a single variant with 6GB RAM and 64GB of internal storage. The storage is expandable up to 2TB using a MicroSD card. The Evolve X comes with a dual-lens setup with one 12megapixel sensor with f/1.8 aperture and another sensor with a 13megapixel module and f/2.6 aperture. The front panel houses a 16megapixel sensor with f/2.0 aperture. Blackberry Evolve is powered by Snapdragon 450 SoC with Adreno 506. The processor comes coupled with 4GB of RAM and 64GB of internal storage. The camera comes with a dual lens setup on the rear panel with two 13 megapixel sensors with f/2.0 aperture. The front camera on the Evolve is the same as Evolve X. Both phones come with interesting security features like a Password Keeper app which stores passwords in a secure way and also allows one to create strong passwords. The operating system also provides Root protection. A feature called privacy shade lets the user hide the parts of the screen that are not in use and just show the parts that are being accessed. The phones let the user allocate RAM according to their liking as well as create different battery profiles. The phone also comes with a Blackberry Hub which serves as a common platform for all communication applications.